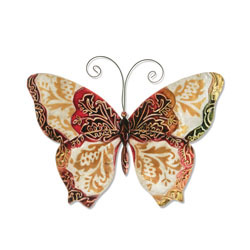 This butterfly can be described as stately, due the artist combination of the color pallet, patterns edged into the tin, and the mix of natural and handcrafted materials. The center of the butterfly is defined with a metallic red, accentuated with a raised pattern painted in gold. The center portion of the wings are crafted using capiz oyster shell, mirroring the patterns of the gold accents.